I met my life partner because of my love of railroad history, hobo music and Ani DiFranco. I remember the first time I saw Utah Phillips perform live at the Kuumbwa Jazz Center in Santa Cruz, California in the late 90s. It wasn't long after his collaboration with Ani DiFranco had come out (The Past Didn't Go Anywhere) and it was on repeat on our house. I wept through most of the performance, just happy to be near him. I was studying the labor movement and drinking up hobo stories and dust bowl lore of the 1930s and using my college radio show to explore the rich musical landscape. It was a time of coming of age. Falling in Love. I soaked in the tales of colorful and heroic characters who dreamed of a more reasonable world - helping to build a ship they would not live to see sail: Mother Jones, Joe Hill and the IWW, Ammon Hennacy from the Catholic Worker Movement, Utah Phillips and the saw-playing self-styled Musician and Revolutionary, Tom Scribner. As I learned about railroad date nails, bucket tramps, and hobo signs - some of my friends took it a step further and joined the hobo tradition, hopping trains and publishing zines about their stories of travels to every corner of America, Mexico and the National Hobo Convention in Britt, Iowa. I just dug out the three zines I have as I write this. They are beautiful treasures - modern stories of traveling as well as stories like "here's the one from my grandpa about wheat harvesting in 1913" handwriting on top of typewritten notes, art, collage, layers and layers of paper and experience - integrated through the ancient xerox machine that miraculously worked even though it had been found behind a dumpster. A few years later, a train-hopping, zine-writing, woods-dwelling modern hobo friend of mine was featured in a documentary called Catching Out, which was screened at the Rio Theater in Santa Cruz at the end of March 2003. I ended up next to his friend, Johnny, who had sweet eyes and a quick wit. By the end of the summer, we were together and still are. A note about train hopping here. It's a part of American history of labor, the Depression and the Dust Bowl era, and is also illegal and extremely dangerous, even foolhardy, and in contrast to historic hobos and migrant workers, these journeys were done by choice and for recreation. While the train hopping folks I knew encouraged safe practices, it wasn't for me. Even as a peripheral participant with no romantic ideas about the rough life, it was an honor to hear the stories of some of the old travelers, inheritors from the original hobos, around campfires and cheap beer in the backyard of a wilted yellow Victorian house. 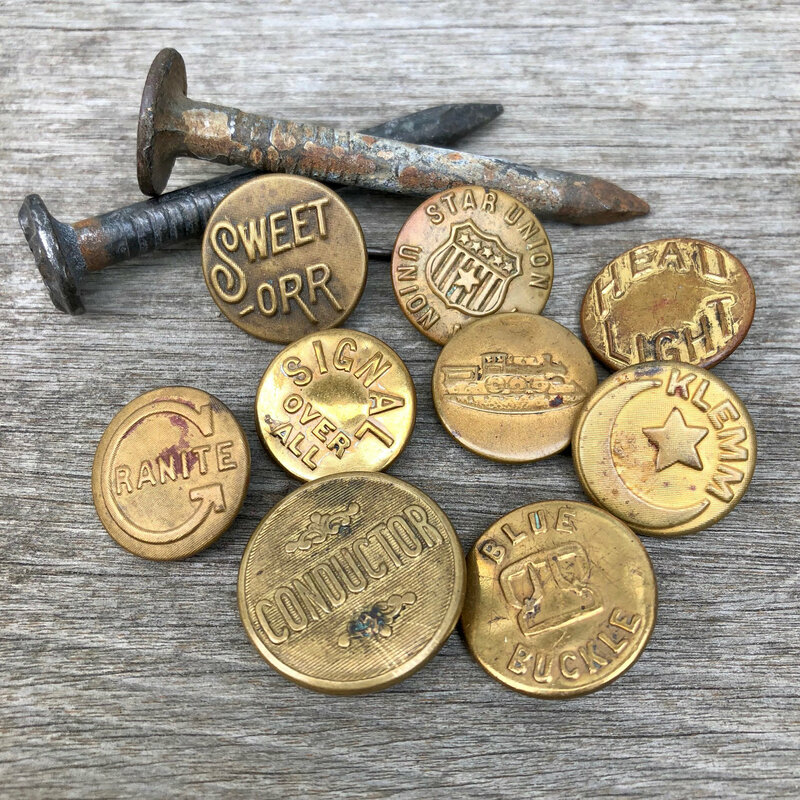 From the 1870s through the 1930s, a huge assortment of branded coat buttons were made and worn on sturdy overall coats by railroad and industrial workers - later by traveling hobos who rode the rails during the 1930s seeking work. Here are some of the work overall buttons (1870-1940) in our personal collection. What remains of this time are ghost signs, vintage advertisements, stories and the buttons themselves. These hard years left behind long memories and a rich tradition of music, community, story and song that we celebrate with the addition of the Steam Train to our collection. 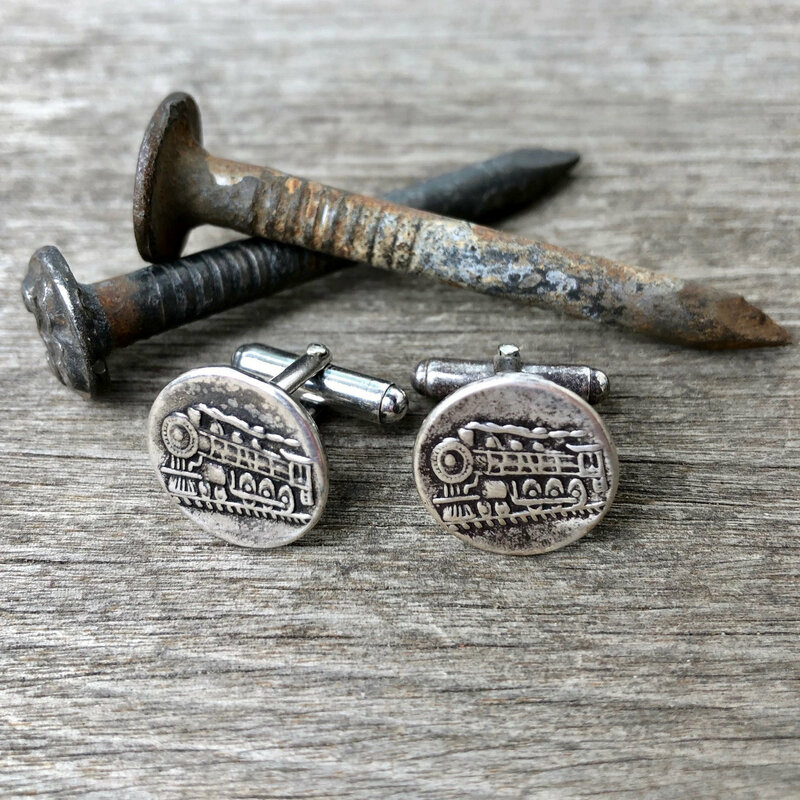 We've cast an original work button in recycled sterling silve and bronze to make a sturdy and lasting keepsake. 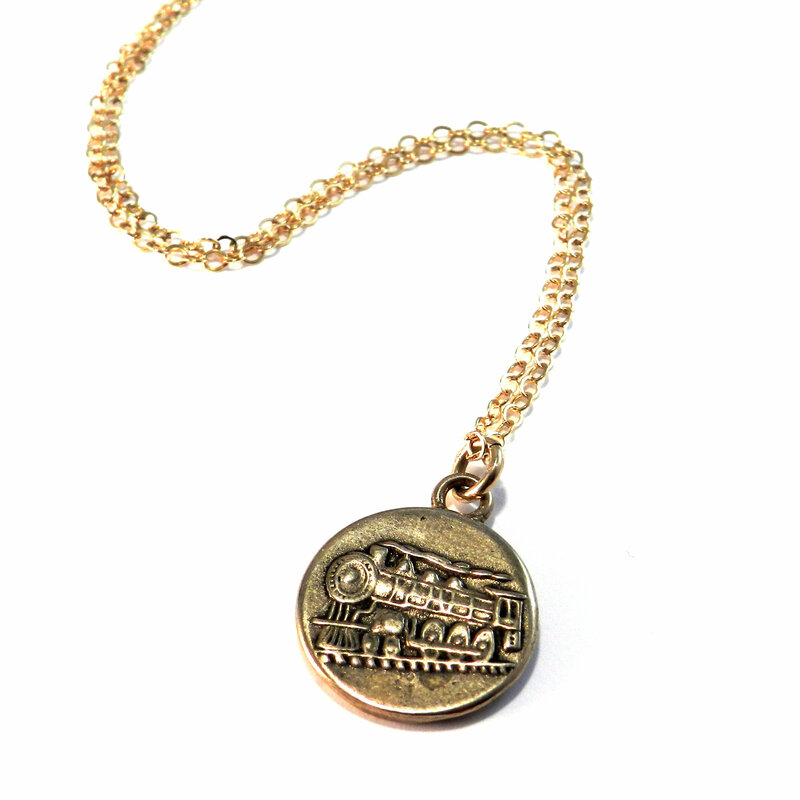 Our Steam Train design is made from an antique work overall button featuring a locomotive - available in our signature assortment of styles.